This is one of my favorite cakes to make. Everyone absolutely loves them. It’s really not very difficult to make once you learn a trick or two. About a week before make the lid to the hat box. Roll out gumpaste tinted pink. Turn over the bottom of the cake pan that you will be using. I used a 10” round cake pan. Turn the pan over and cover with plastic wrap. Try not to have any creases in it. Dust with a small amount of corn starch. Trim the gumpaste about ½” - 5/8 “, Let dry out. Make a variety of different colored flowers and loops for the bow. I like to make it out of fondant. I like my cakes fresh, so I don’t bake them ahead. A day before, bake your cake and cupcakes, allow to cool. Fill with what you or your customer would like and ice in a buttercream. Cover in Fondant, I absolutely love marshmallow fondant. It is easy to make and wonderful to work with. Make diamond impressions using a fondant wheel with a toothed edge, for a nice effect. At each point place a crystal pearl. Then place your flowers mostly at the front of the cake for the overflowing effect. 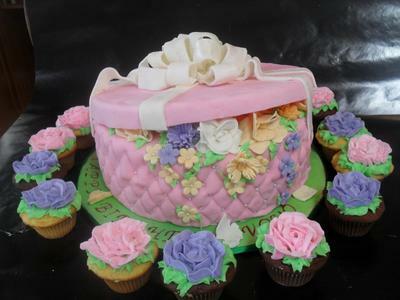 Carefully place lid angling for the open effect and top with bow made of fondant. Ice roses on cupcakes using a 104 tip. TaDaaaaa beautiful and you will be the envy of everyone!! WOW!!! Perfect cake, I love the cake!!! branded confectionery - Keep it Sweet your online sweet shop for traditional and retro sweets. Old favourites such as love hearts, and we stock a range of promotional sweets. Its looking amazing cake.Dont know how will be the test.Wish to check how is the test. This is a very pretty cake. You did an excellent piece of art. Wow this cake is beautiful! Going to try to make it myself not sure if it will come out like that though!